I crib this slightly from the Village Voice, but it’s true. As I write, we are eight hours and sixteen minutes into the Rapture — an international event (occurring at different times across the time zones) but one that has been heavily advertised in New York. 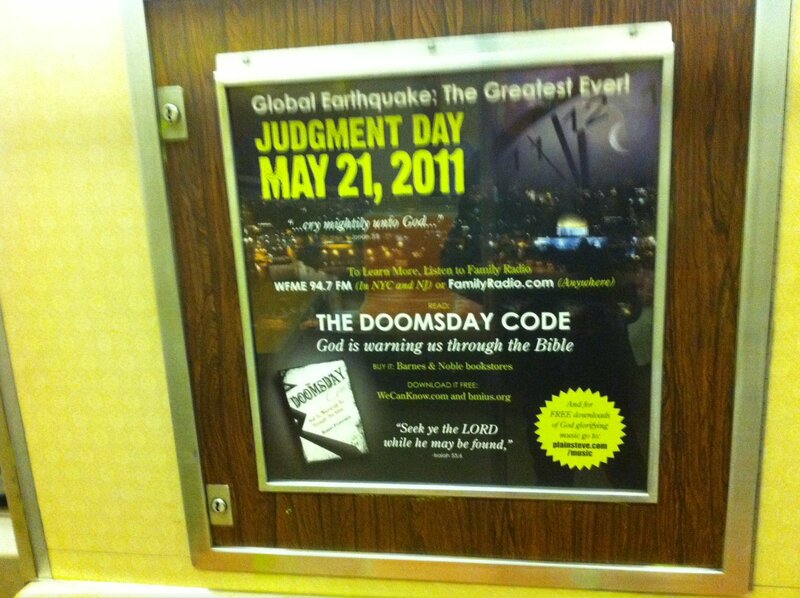 Indeed, when I made my way out this evening, very belatedly, to a dinner party (it was already 9.30pm) I spotted a Rapture ad still up on the subway. It seemed somewhat tragic in the circumstances, since we were almost four hours past the deadline and nothing had happened; and a conversation occurred in which a few of us in the subway car traded jokes about the end of the world. Apparently believers had sold all their worldly goods, including houses, and liquefied their assets, accepting that the end of the world would hit at 6pm. I could only wonder a) how stressed they must have felt between 5.55pm and 5.59 and b) what do they tell people now? A very muscular man on my left, who smelt slightly of alcohol, expressed an interest in where the money had gone. Paranoid though the Rapture was — or perhaps beautifully misled — it’s not the only manifestation of imbalance evident in New York. After midnight I walked towards the N train from my party along 7th Avenue in Manhattan, past posters filled with complaints about the mistreatment, by the FBI, of those who assert that 9/11 was a government conspiracy. 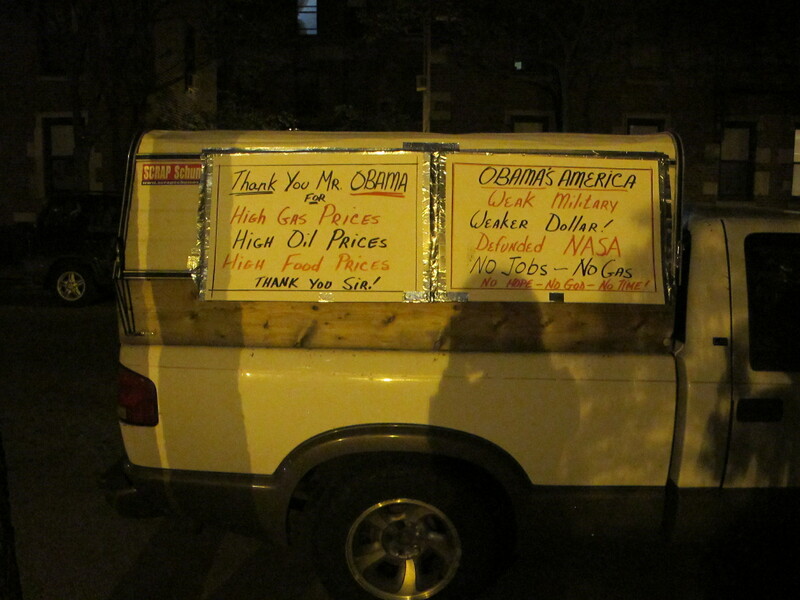 And just to prove that a similar sentiment exists in Queens, too, I include a snap I took last week of a van outside my house on May 13 2011, belonging, surely, to a visiting Republican (or Libertarian?). I haven’t seen it since. I always thought I was a little paranoid. Life in a small city like Dublin can do that to you, since, in truth, you’ll always know someone who knows someone who knows something about you. In New York, nobody knows anything about anyone: but that makes no difference. In urban anonymity, such sentiments thrive — and, who’s to say; they may some of the time be right. I’m just glad they weren’t this time round. That shadowy figure is me.